Summer is coming, and predictions point to it being a HOT one! Temperature plays a key role in the quality of sleep you get. Get ready for summer with specialised pillows, mattress toppers and quilts designed to keep you cool and dry. Over recent years, there have been many studies conducted on the benefits of a good night’s sleep. Good sleep patterns and well-being go hand-in-hand. Quality sleep is just as important to your overall health as eating well and exercising regularly. Experts agree the temperature of your sleeping area affects how well and how long you sleep. “When you go to sleep, your set point for body temperature — the temperature your brain is trying to achieve — goes down,” says H. Craig Heller from Stanford University, “think of it as the internal thermostat.” If the sleep environment is too cold or too hot, the body struggles to achieve this set point. Body temperature is one of the many things regulated by your circadian rhythm, to help your body know when to be awake and when to sleep. When we lay down to sleep at night, our core temperature drops by 1 or 2 degrees, which is one of the cues to your body that its time for sleep. If you are cool, rather than too hot it will be easier for you to drift off to sleep. There are a few things you can do to help facilitate this natural drop in temperature before sleep. Don’t exercise right before bed, because it raises your body temperature. If it’s a hot day and you feel too warm, have a relaxing bath or shower in luke warm water to bring down your core temperature. Keep a glass of cold water next to your bed, and put on a fan to circulate the air. Most sleep experts suggest a room temperature between 18 and 22 degrees for the ideal sleep conditions. This may vary slightly from person to person, and depends on the amount of clothing and bedding you have on at night. It is important to remember that what is comfortable for one person may not be the same for another. Some of the factors which impact whether someone feels warmer or cooler at night include: high body muscle mass; hormonal changes; medications; alcohol consumption before bedtime; and anxiety or stress. In summer, you may not need a quilt, but some people prefer being under the weight of a quilt. Lighter quilts are preferable in the warmer weather so you don’t overheat during the night. Consider whether you usually get hot or sweaty in the night when choosing a quilt. Traditional options for quilts include feather (or down), wool, cotton or microfibre. The first thing to consider when choosing a material is whether you or your family have any allergies. Feather and down are not the best choices for allergy or asthma sufferers. If you are choosing a natural material, like down, it is important to check that it has been ethically sourced. Down and feather can be cozy and warm so may not be your first choice for summer. Even though wool has a reputation for keeping you warm, it is actually a good temperature regulator, meaning it will keep you warm in winter and cool in summer. Cotton is another good choice for summer as it is lightweight, and breathable. Microfibre quilts are a practical choice, if you need to wash or tumble dry your quilts often. However, the cheaper microfibre options, in particular, can have poor ventilation and cause sweating. There is a pretty wide range of synthetic quilts so check the details carefully to see if you think it would be good for summer use. Finding the right pillow is essential if you want to sleep well every night. However, choosing a pillow is not always straightforward, with so many different materials and sizes to choose from. The most common types of pillows are natural fill pillows, synthetic fill pillows and foam pillows. Check out our blog post on how to choose the right pillow for you. Feather and down pillows, as with quilts, are soft and can be warm. However, natural fibres are breathable, so are an option to consider for summer, if you love your down pillow. If you suffer from allergies or asthma, these pillows may not be the best option. Synthetic pillows tend not to be the best option for summer as they can have poor ventilation. Foam pillows are typically made from materials such as polyurethane, latex, or memory foam, and can vary widely in their quality. Some of the cheaper foam options lack breathability and may not be suitable for summer nights. A mattress topper is a removable bedding item, which sits on top of your mattress and under your sheets. When choosing a mattress topper, you need to first consider what your aim is; softness, support, warmth, cooling, pain relief, minimising partner disturbance, or something else. Natural fibre mattress toppers are good for year round use, as they provide extra warmth in winter yet reduce heat in summer. Remember some people have allergies to natural fibres. Memory foam and latex mattress toppers tend to retain the most body heat, therefore they aren’t the top choice for summertime. Microfibre toppers are non-allergenic, non-irritant and dust mite resistant. They are also machine washable and easy to care for. Bambury Australia has just released a new range of bedding called Sonar Thermal Balancing bedding that is perfect for the Australian summer. The Sonar range includes a quilt, pillow, pillowcase and mattress topper. The Sonar Thermal Balancing products feature Outlast® technology, originally developed for NASA, and the only phase change material that carries the Certified Space Technology™ seal of approval. Outlast® absorbs, stores and releases heat from your body for optimal comfort. It has the unique ability to continually regulate your skin’s micro-climate. As the skin gets hot, the heat is absorbed, and as it cools, that heat is cleverly released. Managing body heat in this way means that you can avoid getting hot and sweaty. So, if you are a hot sleeper, or just need a break from the relentless summer weather, then Sonar bedding is for you. It can also be very effective for people who suffer from night sweats or women through going menopause. The best part about Sonar Thermal Balancing products is that not only will they keep you cool in summer, but they will also keep you warm in winter. They are also perfect for partners that can’t agree on the right environmental sleeping temperature. If one of you is a hot sleeper and the other a cold sleeper, then Sonar bedding will stop the arguments. Need further proof? Check out the images below that use infra-red technology to show that the person on the left is a warmer sleeper than the person on the right. Sonar Thermal Balancing products have the ability to manage the build-up of heat by absorbing excess heat and allowing your bed to maintain a more balanced temperature under the covers. Figure 2 shows how the Sonar mattress topper has adapted to each individual’s temperature as evidenced by their unique temperature signatures. 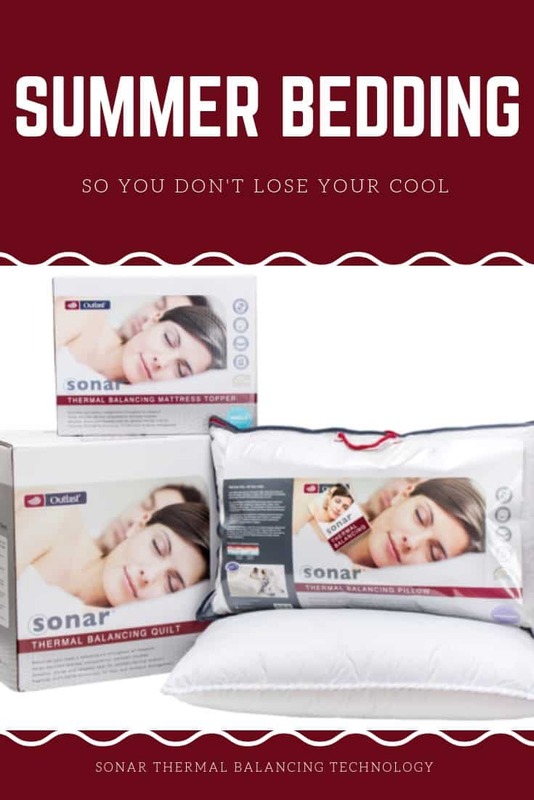 Click the button below to get your Sonar Thermal Balancing quilt, mattress topper or pillow with FREE shipping and next day dispatch. Don’t miss out! Just got this doona in the post and I LOVE it! Amazing! Would recommend! So glad you like it! Enjoy. What a great idea. I think I need some of these quilts and pillows. Sounds lovely. This is a really helpful summary of what works for summer – thanks!